Sundestin is located right on the beach, this unit is direct ocean front, it has 1 Bedroom, with a double bunk in the main hallway, that the kids will love, the living room has a Murphy Queen size bed and the balcony looks at the beach. This unit sleeps 6. It also has a washer and dryer in the unit, we also provide a Keurig Coffee machine with several different kinds of coffee. 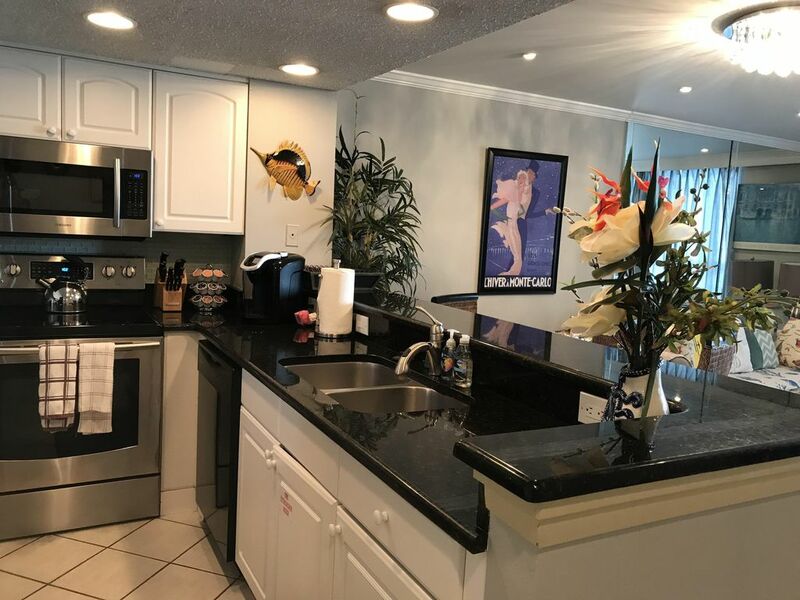 This is truly a vacation home away from home and we updated the kitchen with stainless steel appliances, granite counter tops, and much more. My wife and I live only minutes away from the condo in Emerald Lakes, we answer all calls and handle problems that might arise at any time. We give our guest the royal treatment in service as this is your vacation and we want it to be flawless and a wonderful time to remember. We have always wanted to retire in Destin, as this was the place we came to go fishing. We have stayed here quite a few times and just love the area. The Emerald Green Waters of the Destin beaches was the selling point for us. The beaches around Destin are all covered with the Sugary white sand that makes it so easy to remember why we chose this place. It has some of the most beautiful sunsets in the world, they are just breathtaking. We chose this property for its location, it was directly on the beach with a great view, you can hear the waves form the balcony it is so relaxing you won't want to leave. This unit is located in the middle of everything, Waterparks, The Track and several others just minutes away, this is wonderful vacation spot that you will want to return year after year. We had a great time! The room was beautiful and the resort had everything we could need. We hope to return year after year! This condo is gorgeous, location is great and the view is amazing!! I was extremely impressed with all the extras! It meant a great deal to me to have everything we needed provided for us! I was traveling with just my patient and we didn't get a rental car for just the 3 days since our vacation was all about relaxing on the beach so I was very grateful that I didn't have to get an uber to go to Walmart and buy a bunch of stuff that I would only need to use a little bit of. I brought small bottles of shampoo and body wash but WOW that was even provided!!! My husband, children and grandchildren were very jealous when I gave them a virtual tour. We all plan to come down next. Hopefully within the year and I surely hope Paul and Sang Mees condo is available when we figure out our dates. Thank you both also for texting to see if we needed anything. I recommend you and your condo to everyone! I even let a lady and her adult daughter in to check it out because they were admiring the hallway bunks when our door was open. They both just loved the place also and said they may look into trying to stay there next time. I'm not sure what condo they were staying at but they said 309 was much nicer than theirs. Thank you again for your hospitality! To potential renters... if you are reading all the reviews like I did before deciding, I will say you will not be disappointed! We had an amazing stay here this weekend! The owners answered our questions quickly. We loved the extra snacks and all of the little details that really made our trip more comfortable! We will definitely book again! We came as a family of 5 for spring break. The condo had amazing views and the owner makes sure you have everything you need to enjoy your stay! The building is also great! Can’t wait to come back again! Very clean and beautiful views! Sundestin Resort is located in the middle of Destin with shopping and dining just minutes away. The Big Kahuna water park and the Track are just a few of the attractions here in Destin.